What if I tell you that you do not have to replace your entire carpet for a patch? With a carpet patch kit, some glue, and a star roller totalling $30 total, you can get the best carpet repair all by yourself. Here is what you can do to fix the carpet patch. Wear a plastic glove to keep yourself from dirt and insect bites. Then run your hand over the carpet around the damaged section. With this note where do the fibers of the carpet point. Now place the cutter (without blades) over the damaged area. After that, make almost three clockwise turns to push aside a ring of carpet fibers and then expose the backing. You got to repeat these steps, including the rubbing where you’ll be extracting the patch from. Screw on the cutter blades in step 3 this will make the cutter slice through the backing when turned clockwise. After that attach the pivot screw; that will project from the cutter as far as the blades do. Rotate the cutter three turns with pressure. Do not make too many turns or you will slice through the padding. Now, remove the damaged piece, then use the same method to cut out the replacement patch. Make an arrow on the back of the patch pointing to the direction you rubbed the fibers to make them stand up. Related Article: How To Repair Carpets Damaged By Burns, Stains And Pets! Now remove the protective cover from an adhesive disk. Dip this disk in cool water to temporarily neutralize the glue. Get the disk that is bigger than the patch. Now, make a slit in the disk and slide it between the backing and the padding. Press after 3 to 5 minutes. 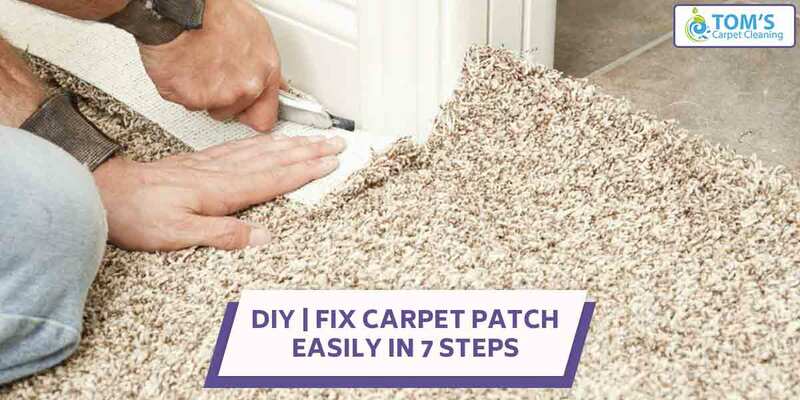 Pluck out any loose carpet fibers in step 6 around the edge of the hole and from the surrounding carpet. Having done that place a narrow line of glue along the perimeter of the cutout. Now carefully align the arrow you drew on the patch in the direction of the fibers in the rest of the carpet. Stick the patch down firmly onto the disk. Fix stuff in 15 minutes as the glue harden soon. We hope this method will help you with carpet repair, and give you carpets as good as new. If you do not wish to go through this hassle you can hire Toms Carpet Cleaning Melbourne. We give same day on site service across Melbourne and its suburbs. Call us 1300 068 194 to know more or to get a free quote.